People are getting used to that soft, female robotic voice in their cars telling them where to make the next left turn as they pass through an unfamiliar city’s traffic tangle. But they might not imagine that the very same GPS technology is sitting on the control panel of the heavy equipment at the nearby highway construction site. Like, can’t dozer drivers find their work sites by themselves? Actually, using satellite technology to pinpoint the position of a backhoe’s shovel or direct the blades of a bulldozer or grader is not all that new. In fact, since GPS signals can tell you where you are within a foot or so, it has largely replaced the surveyor’s string and chalk as the method of choice to tell you what spot to dig in and how to coordinate the precise locations involved in most construction sites. 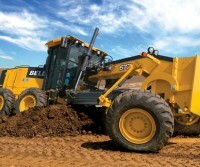 A small screen in the cab of a dozer, for instance, can tell the operator within inches, exactly where he is on the site. It can tell him how steep the grade of a road should be and if he’s doing it properly as the job goes along in real time, without consulting a foreman. For a farmer, the technology can guide tractors and combines, helping adjust the rate of planting and monitoring crop yields. Big-dig construction equipment companies are on to all of this, and one in particular – NMC of North Platte, NB – is making it a specialty. The third-generation business with more than 600 employees has a whole division dedicated to it – NMC Technologies – with a dozen dedicated specialists developing and selling the precision-digging high-tech hardware. Heavy machinery requires constant maintenance to keep it in good working order. 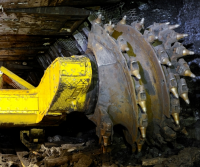 Conversely, poorly maintained large machinery equipment runs inefficiently. Breakdowns are costly and safety is also an important consideration. Many types of large machinery have multiple operators. One of the ongoing inspections on any checklist should be overseeing the correct operation of the equipment. Large machinery should be inspected as soon as it is purchased. Operator training is usually done at that point, but training needs to be kept up. Employees come and go, skills become rusty and poor operation leads to breakdowns. 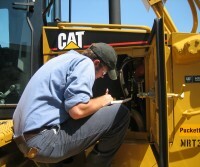 Operator manuals can be revised for the specific work situation. They can be rewritten in simpler language. A short manual can be provided to each operator for easy reference. And, if you operate in a paperless environment, you can rest assured operators use the most current version of each manual. One other note is to identify best practices, which can then be applied to other facilities or geographic locations. The knowledge you learn about how to maintain your equipment can become quite valuable – be sure to best leverage this important knowledge and use it at every applicable location. To reduce repair costs and minimize losses in productivity, more manufacturing operations are turning from preventive maintenance (maintenance based on a fixed schedule) to proactive maintenance and predictive maintenance (maintenance based on objectively determined need) in order to protect their high-value assets. Condition monitoring of crankcase, hydraulic, motor bearings and gear lubricants plays an important role in the maintenance of equipment including heavy machinery and plant equipment. Currently, lubrication condition monitoring is typically accomplished by taking samples in a prescribed manner and sending the samples to a laboratory for analysis by an array of analytical technologies. The recent availability of field-portable, rugged and easy-to-use analytical instruments for use directly at the site of manufacturing operations changes how the condition of in-service lubricants can be monitored. These field-ready analytical tools provide users with near real-time information and allow them to monitor the lube point level of machinery quicker and easier than traditional methods where samples are sent to laboratories for analysis. This results in rapid, actionable decisions, thus enhancing proactive maintenance programs.